It's a Click Away. Contact Us Today. Facebook fan pages have long been a great lead generator for business but I feel now more than ever, it’s becoming a necessity. Facebook has overtaken Google as the most visited website, they have over 500,000,000 users and they are growing every day. (reference Facebook Statistics). What this means is that your clients and your potential clients are embracing Facebook, which is changing their whole perception on how they interact with products and services on the Internet. You can’t take that ad that worked in the yellow pages or for direct mail, slap it on a website, and start counting your sales. Relationship marketing is here. A fan page with Facebook is much more interactive, informative, and much less in your face than traditional media. It’s permission marketing at its best because it also utilizes relationships to increase your exposure and allow others to suggest the page to their friends. You have the potential to grow your fans and the reach of your product or service exponentially. You must provide good information, however, and not be seen as trying to sell people. If you’re trying to sell with marketing pitches, you will not get anywhere. If you provide good tips, good information, and ask good questions, you will have an interactive Facebook fan page that will make your company more money. Setting up a fan page is easy. You can go to any fan page like the Detroit SEO & Web Design fan page, scroll down all the way on the left sidebar, click on “Create a page for my business”. You can pick out a name and create your page but I wouldn’t be so hasty. There are a lot of considerations, however, before creating your page. Your fan page should be easily recognizable by your clients or potential client interested in your product and it should also include good keywords. Be careful with keywords, however. If you are too general (i.e. 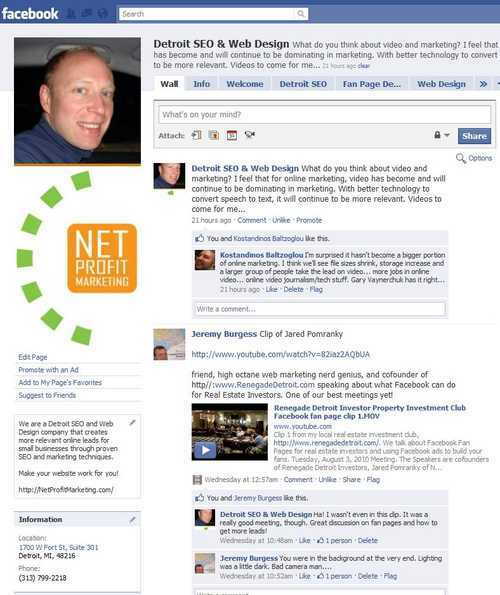 “Real Estate”), Facebook can make your page a community page and you lose all control. Also, if you stuff too many keywords into your page name, it’s going to look like spam and no one will click on it. Once you receive 25 fans, you can select a custom URL for your fan page (like www.Facebook.com/DetroitSEOWebDesign) by going to http://facebook.com/username, clicking on “Set a username for your Pages”, selecting the page, and typing in your custom URL to see if it’s available. I would also warn you to not be too general in this selection either. You want to make it relevant to your users or someone that is searching for your product or service. Setting the name is great for SEO but it doesn’t help if you’re too general. A bad page URL is “RealEstateInvesting”; a good page URL is “DetroitForeclosures”. Be specific! There is a great opportunity on your fan page to target a message specifically for visitors that don’t “Like” your page yet. You can set the home page for people that aren’t a fan of your page yet to the Welcome page. On the welcome page you can give them a quick introduction to your company, let them know why they should be a fan of your page, and how they can become a fan. What to put on my fan page? You don’t want to overwhelm your fans but you also don’t want to drop out of site with your fans. I suggest adding 1 good comment or piece of information each day. Make it non-sales, something related to your business, and informative. You can also ask open ended questions like “What’s your best marketing medium?” or something that’s divisive like “I think that soccer is the best sport in the world.” to spur some replies and discussion. Overall there is no easier way to get going in relationship marketing to a huge audience than with a Facebook Fan Page. You can get your page setup pretty easily but I definitely recommend utilizing a professional for help with your page name selection and for designing your Welcome tab and other secondary tabs. Net Profit Marketing provides customized website solutions and online marketing to help your business grow. Learn more about our Internet Marketing services or Contact Us to find out how we can help.